Disclaimer: I’m pretty slow when it comes to reading nonfiction. I have a pile of books on my nightstand at any given time, and the one that stays the longest in that pile is always the nonfiction book. On a side note, it would be more accurate to call my nightstand and the floor space beside it “The Stacks”. Please tell me I’m not alone in this. Well, I know I’m not, because you should see my dad’s bedside table. I don’t even know why we have tables next to our beds. Bookshelves would be so much tidier. Anyway, I am always in the middle of a nonfiction book. This is not because I’m particularly scholarly, but because I read nonfiction at a snail’s pace (can snails read?). There’s no “scope for the imagination” in it. I like to think it’s because I’m really mulling over all the facts and advice that I’m taking in when I read nonfiction, but usually it’s just because I get bored with it quickly. It’s kind of painful to admit that. But there it is. However, there are some non-fiction books that I find enthralling. I’ll write about two of them today. In my last post, If I Were A Facebook God, I wrote about how discouraging some Facebook statuses are on Monday morning. I, maybe rather frustratingly, spoke of finding some “joy sugar” to sweeten the hard days. I realize I may have left some of you wondering how in the world one finds that stuff. Well, there’s no way for me to explain all that on a book blog. Already, some of you are probably wondering, “When is she going to talk about actual books?” Enter, some self help books. I don’t pick up many “how to” books. And any book that has “dummies” in the title is a book I don’t really want to read. Publishers would do better to appeal to my pride with titles like “Knitting for The Moderately Bright.” However, I’ve read a couple of books that have changed my perspective or helped me realize what perspective I need to take on being joyful in life. One of these is based on the Christian perception of joy (that happiness is based on circumstances but abiding in God and His love brings joy in any circumstance) and one is a non-religious book that equates joy and happiness as pretty much the same thing. 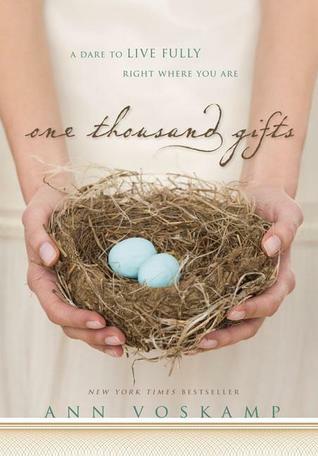 My life would not be as joyful as it is today without the book One Thousand Gifts: A Dare to Live Fully Right Where You Are. Writer Ann Voskamp opens the book with a heart wrenching memory of her own childhood. She describes her climb out of the darkness surrounding her, the fight with darkness of mind, and the continual struggle she embraces to find joy. Her tangible way to discover the joy in life is to keep a journal of “gifts.” She writes down every single thing she can call a gift: sunsets, soap bubbles in the sink, toys on the floor. Voskamp begins to see beautiful little things, and even beauty in ugly things, like painters tape that’s been on the wall for forever or mismatched socks. Each thing can represent so much more than what it actually is. Each object, each happening is a gift, sometimes in disguise. I haven’t kept such an all-encompassing joy journal as Voskamp did, but I do have one and it helps to write in it and to go back and read it. What helps more, though, is the realization that God’s perfect love is real and evident in dozens of beautiful gifts in any one day (or hour!) in the midst of anything. Voskamp’s writing is elegant in a detailed way, but not flowery. She draws sketches of her life with words. Crusty pots. Sun streaming on dusty hardwood floors. Her blog, A Holy Experience, is the most beautiful blog I’ve ever seen, because of her words and her photographs. Voskamp was my favorite blogger before her book was released, and now she’s one of my favorite writers, if not my absolute favorite. I hope she writes many more books. 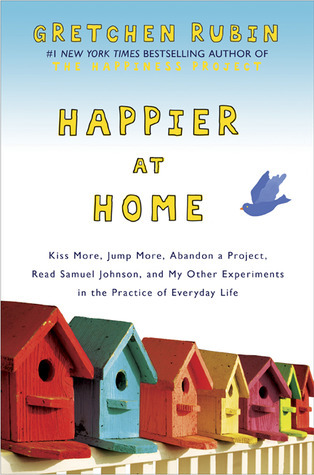 Another book that had me think harder about joy is Happier At Home: Kiss More, Jump More, Abandon a Project, Read Samuel Johnson, and My Other Experiments in the Practice of Everyday Life. Gretchen Rubin, a self-titled happiness guru, writes about her focused project on making her home life happier. This is a good book if you’re looking for practical ways to make life happier without altering your day-to-day life very much. Rubin broke her project down into nine sections: (1) Possessions (2) Marriage (3) Parenthood (4) Interior Design (5) Time (6) Body (7) Family (8) Neighborhood (9) Now. Some of it fell a little flat. For example, I remember nothing from the marriage section, and the only thing I remember about the Body section was Rubin’s decision to become a perfume lover. However, there are parts of it that have stuck with me. In the preface, Rubin writes, “I didn’t want to look back, at the end of my life or after some great catastrophe, and think, “Then we were so happy, if only we’d realized it.” Well, I don’t want that to happen to me either. A quote that stays with me now in the every day grind of raising little ones is, “The days are long, but the years are short.” It’s a common thought, but it’s so true. It’s important for me to grab the moments I can spend with the people that are here now. I may have years with these people ahead of me (or I may not! ), but I’ll never have this version of my son or daughter again. I also liked ideas like “go shelf by shelf” when it comes to simplifying the home. Don’t just say, “I’m going to straighten out this closet” but seriously review every object and think through why you have it and where it should be. One shelf a day. I could do that. I really enjoyed this, Alana. My bedside table is also piled high and the floor and the basket next to the table. They contain books I love and want to reread and current ones – I have six books currently in progress and they are all non-fiction – I rarely read fiction though I like it – I am so inspired by history and biographies.One Thousand gifts is excellent – read that one twice!